Many readers find their way to this blog because they are interested in learning more about instructional design. I'll share with you what I know and point you in the direction of some great resources where you can learn even more. I've been working as an instructional designer in the corporate training and e-learning field since the mid-1990s. For me, instructional design is about designing "engaging and effective" asynchronous learning experiences (web-based training programs). I've also had a few gigs as a classroom teacher, which has mostly been about implementing content and curriculum that was designed by others. 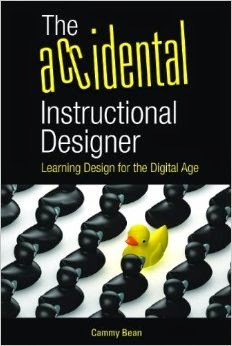 Some instructional designers have advanced degrees in instructional design, but many don't. My learning has all been completely informal. In Memoirs of an Instructional Designer, I describe how I got to the exalted position (ahem) in which I now find myself. As you'll see by reading my job description, instructional design can include a whole lot of other things, especially when you work at a small company. I'm a writer and a schmoozer. Many instructional designers are also responsible for building and developing content into working courses. I've always had the good fortune to have a team of graphic designers and programmers who do that heavy lifting. In Instructional Designers' Tools I talk a bit about that. A few months ago, I started compiling a reading list at Beginning Instructional Designers Toolkit. Some of these resources can now be found in the sidebar of this blog. You can also check out my instructional design bookmarks at deli.cious. In Confessions of an Instructional Designer I share an aha learning moment when I realized just how much I don't know about instructional design. Like me, you may sometimes need some Instructional Design Inspiration. Thanks for the props Cammy! Thanks for all the information so far Cammy! I've found your blog very helpful for ID and the ISD process. Glad to help, Tex. Feel free to join in the conversation here and point out any useful resources you uncover. HI Cammy, I am an Instructional Designer working at a reputed firm in CHennai, India. I came to your blog via Linkedin. Here, in India, many people from diverse backgrounds ranging from Arts to Engineering get into Instructional Design. Many of them learn ID only via their hands-on experience. I would like to know whether people in your country undergo any specific courses in order to gain knowledge on ID, if so, what are they? It would be great if you could provide some info on this. As with India, I think the US is really all over the map with that. I've been in the field for almost 15 years and I don't have an advanced degree. In fact, a survey on my blog (see the blog sidebar on the right) shows that only about 38% of practicing IDs have advanced degrees in the field. That said, there are plenty of Certificate programs and Masters Degree programs out there, should someone want to go for it. Thanks, Deanna. There's a whole wide world of people out here willing to share what bits and dribs they have. Looking forward to you joining the fray! Interesting to find out how others get started in the industry. I agree reading and subscribing to blogs is a great way of learning therefore to be given an idea of who are possibley leaders in the field is a valuable resource for those just starting out thanks. Any other suggestions for those getting started in the field? I'll starting to work towards my Master's degree in Instructional Technology/Training. In honestly, how is the job prospect looking? Any advice for a newbie? Thanks a lot! The field is alive and well. I think there are lots of opportunity in the ID/elearning space -- corporate training, k-12, higher ed. Find your passion, find your niche -- and go for it! I've been reading, learning, and self-training toward becoming an ID for about 6 months. I'm trying to massage the experience I have into a new job, but I don't know yet whether that's really going to work out. I have extensive (20+) years as a graphic designer, but mostly for print. I have an M.Ed. and public school teaching experience, plus some adult education experience (a couple of part-time gigs lasting a couple of years each). A career counselor told me I shouldn't have to take an entry level job (which is good, because every job I see asks for at least 5 years experience.) I'll report back and let people know how the search is going, in case they are going thru the same process. Does anyone have any experience with the instructional design courses publish by Wavelength? I'm very tempted to sign up for one. The course description sounds great. I want to get more theoretical knowledge about ID, but the U.S. courses I've seen are expensive, or not that detailed, or both. For example, ASTD has a certificate, but it's very expensive for a one-day seminar.